We didn`t even imagine that with our first auto VR project would immediately get to the pages on the federal magazine. Although before that, we did a lot of interesting things in VR, and these projects were not noticeable for a wide audience. For example, VR cinema, VR museum, VR sports and even VR Easter, but apparently it was in order to properly skilled hand before working with huge brands. And now, this has been confirmed. With our project Jaguar test – drive we are on the pages of Forbes. It’s really very nice. 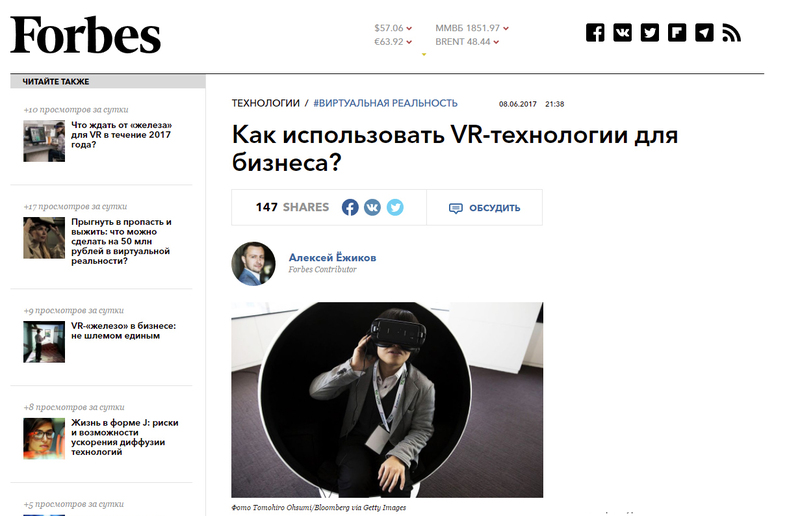 Thank you very much to Alexei Ezhikov, who appreciated our work and mentioned in his big VR article about our modest company. But we, in turn, do not stand still and prepare for you new more interesting and much technically complex projects. ← The Jaguar VR test drive presentation. Thank you for the auspicious writeup. It in fact was once a entertainment account it. Look advanced to more brought agreeable from you! By the way, how could we keep in touch? and the way in which through which you are saying it. You make it entertaining and you still take care of to stay it sensible. I simply want to mention I’m very new to weblog and actually savored your blog site. Likely I’m planning to bookmark your blog . You absolutely have really good writings. Thanks for sharing with us your blog site.